Seasoned athlete or relatively new to training, your body still deserves the best possible nourishment to recover, maintain and grow. If you want a high quality and easily digested whey protein formula that is also great value then this is the formula for U. Simply mix or blend with 250-300ml of water or skim milk and consume 30 min before training and/or immediately post workout. The low carb and low fat characteristics also make it suitable between major meals or as a convenient on the go snack. NATURALLY FLAVOURED PROTEIN INGREDIENTS: UPROTEIN 100% Whey Protein Hydro + Enzymes Blend (96%) (Instantised Whey Protein Concentrate, Instantised Whey Protein Isolate, Whey Protein Hydrolysate, Proteolysis Digestive Enzymes (Papain, Bromelain), Anticaking Agent, Socially And Environmentally Responsible Cocoa, Natural Flavour, Acesulfame K, Sweetener (Sucralose). Contains milk, soybean products. Soybean products (Soy Lecithin) is used to instantise whey proteins and is less than 1% of the whey product. Made in Australia from local and imported ingredients. Halal and gluten free ingredients. 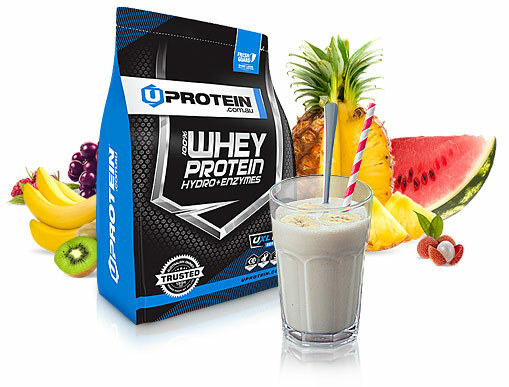 UNFLAVOURED PROTEIN INGREDIENTS: UPROTEIN 100% Whey Protein Hydro + Enzymes Blend (96%) (Instantised Whey Protein Concentrate, Instantised Whey Protein Isolate, Whey Protein Hydrolysate, Proteolysis Digestive Enzymes (Papain, Bromelain). Made in Australia from local and imported ingredients. Contains milk, soybean products. Soybean products (Soy Lecithin) is used to instantise whey proteins and is less than 1% of the whey product. Made in Australia from local and imported ingredients. Halal and gluten free ingredients. This has a large a mount of protein for a small amount of calories, and it tastes great. Perfect product. This is a great product, a good protein powder that doesn't taste terrible, I got Chocolate and Vanilla and really enjoy them both. The service was great too, fast delivery and well packaged. I recommend this protein powder to anyone looking for great supplements. I have nothing bad to say about uprotien whey protein hydro and enzymes, it gives you value for money and it's good quality as most protein I've had doesn't have such a high percentage of protein in it per 100g it tastes fantastic and has great consistency while drinking it I really like that, as a personal trainer I have seen a lot and used alot of supplements I can honestly say I would recommend this to everyone whether it be a beginner in the gym or a veteran or a serious athlete this protein powder is for you give it a try you won't be disappointed trust me. 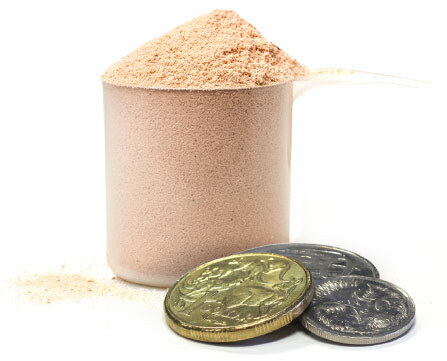 This is one of the best protein powders on the market for value, results, taste and convenience that is made in Australia for anyone seeking to supplement their diet. Love the vanilla custard flavour, we use it when making smoothies and also add to yoghurt. The vanilla is really versatile and i just add a bit of cocoa powder if i want a chocolate flavour. Not only is this one of the nicest tasting protein powders that mixes well, but the price is so good! Super easy to buy online and delivered in just a few days, this is now our Go-to for Protein powders! I wish I had found out about U-Protein years ago! Like the choc brownie. I don't think I will try other flavours.. Cos that my fav.. Have to see long term use has any benefits. So far I've been stoked with the Uprotein, delivery was super quick which was amazing and it tastes good and seems to be doing the job. What I like is the variety you have as far as flavours...flavours get boring fast so to be able to split flavours within an order is great. Something I think you could look at is how many pop-ups are on your website. It kinda just ended up getting in my way and frustrating me as I was trying to order... Something clean and easy will always make me want to come back. Awesome Product I ever had!!!!!!! Awesome product I ever had!!!! I had Choc Brownie flavor and it was very tasty. Also, it is easy to mix and smooth taste as well. In addition, there was no bloating and no thirsty after use. The price is very reasonable rather than other brands. A great product at a great price. Brilliant service with super fast delivery. Banana sundae tastes delicious. The perfect balance of sweetness in the flavour. No tummy ache! I've tried a number of proteins over the years and uprotein by far out classes the rest. With noticeable muscle gains and muscle recovery, whey protein hydro+enzymes has it all and the different flavours just tops it all of, i wouldn't have anything else and the prices are unbeatable. I've tried a lot of protein powders. Uprotein however stands far above the others. I don't feel bloated, I don't have any wind and I don't feel thirsty after consuming Uprotein powder. It mixes incredibly well and has a really smooth texture. Definitely my go to protein powder from now on. If only I'd tried it earlier. As a 64 year old long distance runner I'm seeing a difference in my running strength and muscle renewal. I'm really happy with this product. But what sets WHEY PROTEIN HYDRO + ENZYMES apart from the other brands is the taste. I look forward to having it just with water or in a fruit blend shake. It is an excellent product. I have recommended to all my running friends. The chocolate browny flavour is great. Mixes really well in a shaker and texture is really smooth. The only improvement I would say is the bag it comes in rips easily and I had to store it in a container as the seal broke. We Aussies seem to be a bit hard done by when compared to the availability and affordability of supplements afforded to our mates in the US. 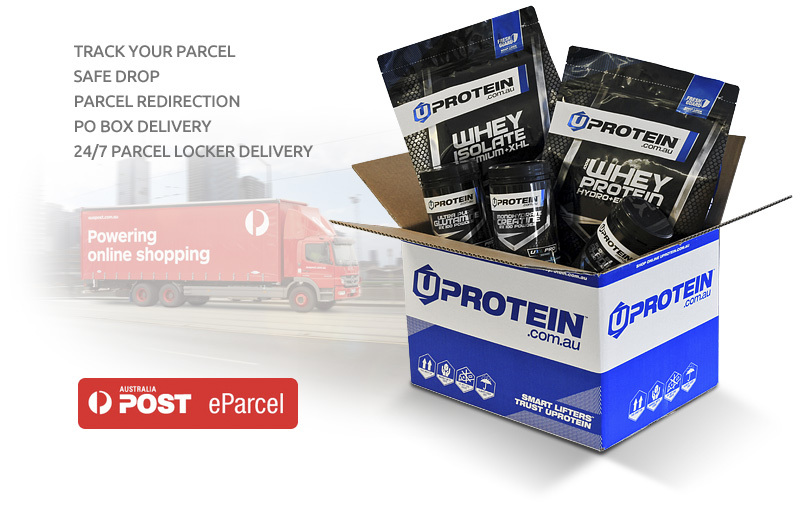 I've tried at least 10 Australian suppliers over the years for bulk protein and this is the first product I've gone out of my way to recommend to other gym-goers. I call it the "every man" protein powder, we don't want to be paying an arm and a leg for quality supplements (most of us are trying to gain mass after all). This is the product I would recommend to new lifter and veteran alike, I'm confident you won't find another Aussie product that tastes or mixes better for the price. As far as nutritional content goes I keep it simple, I'm just looking to substitute a bit of protein intake from meals, it is what it is, protein supplements aren't the make-or break for your goals. Always delivered quickly, professional company that I look forward to doing business with for years to come, keep it up! *Whether you buy 1kg or 100kg, make it all choc brownie. Too good. 20yo full time student with no affiliation with UPROTEIN. *Overall I rate them and this product 43.5/50 or 8.7/10. I have never left a review of any product on any site before, however I was quite impressed by the service and felt inclined to leave one. As a uni student, i'm definitely looking for value, so i've made my way through many a dime a dozen different supplement brands. Buying in bulk (~5kg) at a time, I decided to try UPROTEIN this time. I'll give it an overall score out of 50. Score is relevant to the price of the product and its competitors. TASTE/TEXTURE: I got the choc brownie and banana sundae flavours. I have no issues with mixing or clumping, and both flavours are quite pleasant. There aren't as many varieties for flavours as some brands, but I don't think that's super relevant. Only issue to pick is that the packaging doesn't actually specify the flavour on the outside. I rate this an 8/10. INGREDIENTS/QUALITY: i'm not a nutritionist or scientist, nor will I pretend to be. So the most important factor is really just protein % per 100g. At 80.9g protein per 100g, it is definitely respectable as non WPC. The previous brands i've used e.g SSD or BBP tend to fall around the 80 - 81g mark for standard whey. There is also extra additives which would benefit some, but for the sake of this review i'll ignore those. This gets an 8.5/10. PRICE and REPUTATION: This is one of the most important factors for me. you will struggle to find 4kg of whey for $100 from another reputable brand. I have previously bought 5kg for $100 from SSD. However there just wasn't enough information or reviews for me to justify continual purchasing. As a trustworthy and mainstream brand, 4kg at $100 is fantastic. I rate it 9/10. POSTAGE and DELIVERY: This is what did it for me. As soon as I opened the parcel locker and saw the branded box, I decided I was going to leave a review. My order came within 4 days via my absolute preferred courier Aus Post (I can only get deliveries via parcel locker) so that was a huge bonus for me. One of the reasons I stopped buying from BBP was due to them using a dodgy courier. Not only does it come in a branded cardboard box, but it also comes with air cushions - other brands i've used have literally sent the protein packages in a tightly wound material comparable to a garbage bag, with exploded protein everywhere inside. The only problem i'd have is - with the quality comes a price, auspost will cost a bit more and so too will the packaging. However this is quality i'm willing to pay for and I give this area a 9.5/10. It's sad you can't trust manufacturers or brands these days, especially in the fitness industry where everybody is plugging new supplements everyday. Basically in a world where everyone is out to make a buck with little regard for service or performance. 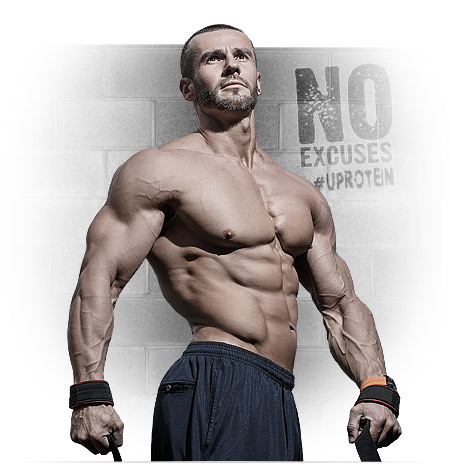 UPROTEIN is a reputable company with a great brand, good price, value and service. I would highly recommend this to friends, family and anyone really. Fantastic value and I will be ordering again until I find a better alternative. As of right now leaving this review, this is my go to brand and product. Quick disclaimer* - they do offer incentives for leaving reviews. However I don't care much for it and just wanted to leave a review solely because I was impressed by the quality of the product and service, especially in comparison to the numerous other brands i've tried. Hope the review helps. 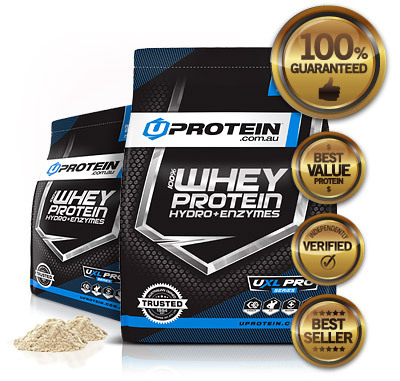 I am really impressed with my recent purchase of 4kg Whey Protein Hydro from from Uprotein. The formula looks to work quite effectively and you can see the difference between Hydro and regular protein in the way the powder reacts with water. The taste is great and the delivery arrived quickly. Very happy customer. Tried the cookies & Cream. Delicious! Great flavour, quality protein at a good price! Why would you go anywhere else? I checked lots of different protein. This one is the best value for money. Good taste, especially Choc Brownie - not too sweet, balanced. No clumps with milk whatsoever, optimal protein intake per portion. 4 kg (2+2) is value for money, one of the best on the market. FINALLY A PROTEIN SHAKE THAT TASTES GREAT , THAT DOES NOT UPSET THE STOMACH. HIGHLY RECOMMEND - DO WASTE YOUR TIME LOOKING AROUND - THIS PRODUCT HAS IT ALL ! Prompt delivery and quality protein at a competitive price. Mixes great and tastes great. I'm glad I have been able to find an online store that I can buy from with confidence. Much more convenient than buying in store. Awesome you have discounts multiple purchases!! I will definitely buy from UProtein again. The whey protein mixes very well and tastes great. Vanilla custard and chocolate brownie taste delicious! Been training solidly for the past 2 years have tried over 12 different brands of protein and have found that I have come back to U Protein. while on good diet u and taking u protein I get a better result., I feel great and not bloated like some proteins make you feel, plenty of energy and great before and after a work out. Having also tried other proteins U protein has the highest amount of protein content in it. Great service and quick delivery!!! I love these U Protein Whey products. They mix very easily with no clumps and they taste great. So far have tried the Banana and Vanilla. Looking forward to trying the Chocolate Brownie. Super fast delivery as well. Placed order and received the products two days later. Great service! 4kg for $99 you won't find a better deal going around, and is quite comparable to some of the better known brands on the market. I have been using Oxywhey for a long time and I get quite similar results in terms of mixing, taste and results. Definitely recommend. I have tried different brands of Whey Protein powder with veering results and taste. 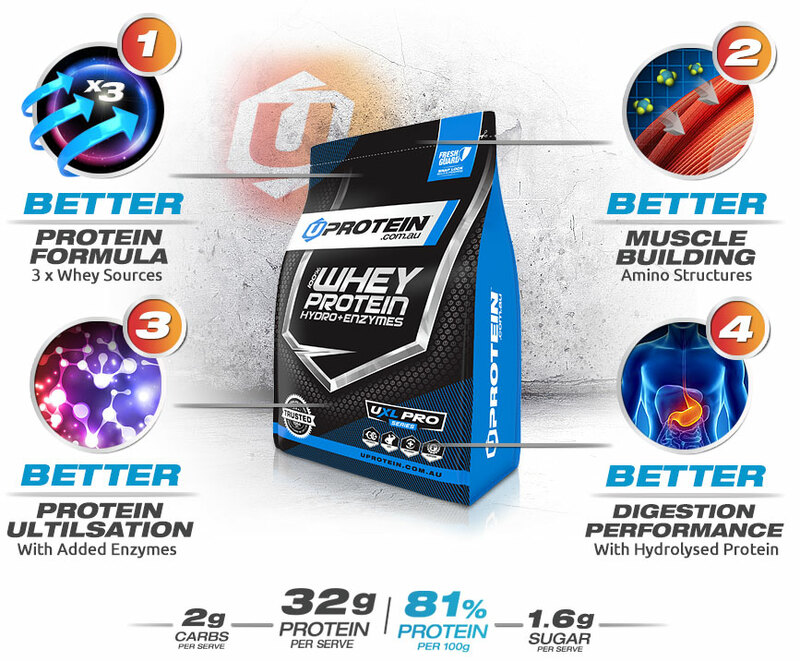 I am very happy with the U Protein product, I am recovering quicker from my workouts and am seeing a better muscle build also, and the flavours and taste are great. Overall great product and I will be using it for a long time to come, highly recommend. This powder is great! I ordered the choc brownie and banana split flavours and I love both. The combo is nice too! Good amount of protein, tastes great, mixes well, and fills me up. Would recommend. Best in the market with the ingredients and price. It does the job. ✔ 32g/81.4% Protein - Delicious Flavours. ✔ Exclusive Whey protein only formula. ✔ Packed with muscle building BCAAs. ✔ Huge 4kg Value Deal - 100 (40g) Serves. Reward your body with 4kg (8.8lb) of Superior 100% Whey Protein formula. Including Concentrate, Isolates and Hydrolysed whey protein provide a more advanced spectrum of muscle building Amino Acids than using cheap grade WPC formula. Protein digestion isn’t easy on your body. Added enzymes give you superior opportunity to absorb every gram from every serve. Enjoy more muscle faster with clinically proven ingredients scientifically selected to build serious muscle, aid digestion and boost post workout recovery. Three high quality protein (81.4%) sources expertly selected deliver optimum Branched Chain and Essential Amino Acids profiles. Uses latest enzyme and micro cross filtration processing techniques ensures fast absorbed protein particulates that retain Amino Acid potency. High Biological Value (BV104) produces ideal nitrogen environment sparking natural anabolic signals that stimulate muscle growth. Protein digestion isn’t easy on your body. 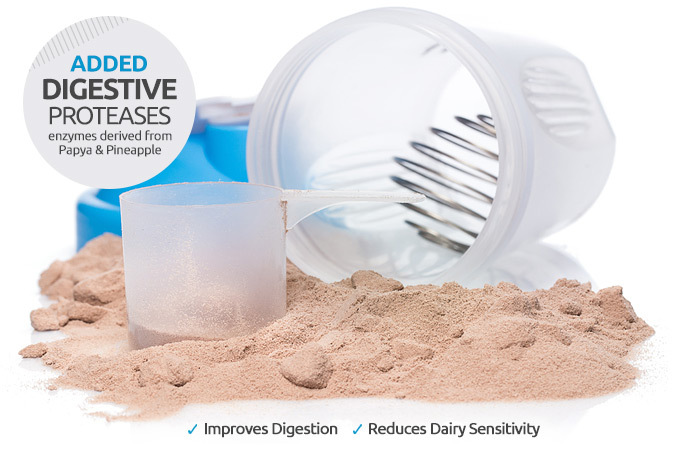 Added enzymes give you superior opportunity to absorb every protein, minimise bloating and gas. NATURALLY FLAVOURED PROTEIN INGREDIENTS: UPROTEIN 100% Whey Protein Hydro + Enzymes Blend (96%) (Instantised Whey Protein Concentrate, Instantised Whey Protein Isolate, Whey Protein Hydrolysate, Proteolysis Digestive Enzymes (Papain, Bromelain), Anticaking Agent), Socially And Environmentally Responsible Cocoa, Natural Flavour, Acesulfame K, Sweetener (Sucralose). UNFLAVOURED PROTEIN INGREDIENTS: UPROTEIN 100% Whey Protein Hydro + Enzymes Blend (96%) (Instantised Whey Protein Concentrate, Instantised Whey Protein Isolate, Whey Protein Hydrolysate, Proteolysis Digestive Enzymes (Papain, Bromelain). Made in Australia from local and imported ingredients. Both products contains milk, soybean products. Soybean products (Soy Lecithin) is used to instantise whey proteins and is less than 1% of the whey product. Made in Australia from local and imported ingredients. Halal and gluten free ingredients. The way a protein is hydrolysed is supremely important, thats why we only use the Enzymatically Hydrolysed Treatment (EHT) process. This ensures more amino structures are available, ensuring optimal nutrient uptake and true muscle results. that's why we look locally and globally for suppliers who have the scale and technology we demand. 2. adopted a "direct from the manufacturer" model, thereby cutting out the middlemen manufacturers and excessive over heads. At around $1.00 per serve, this best-in-class formula is also Australia's best value. Seasoned athlete or relatively new to training, your body still deserves the best possible nourishment to recover, maintain and grow. If you want a high quality protein powder and easily digested whey protein formula that is also great value then this is the formula for U.